3D software for individual use on a personal computer. 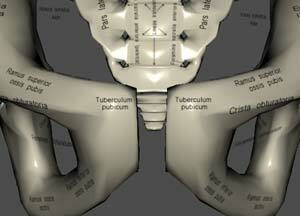 Designed for medical students, teachers and doctors. The program was created under the guidance of Head of Department of Human Anatomy of the Peoples’ Friendship University of Russia (RUDN University) Kozlov Valentin Ivanovich. 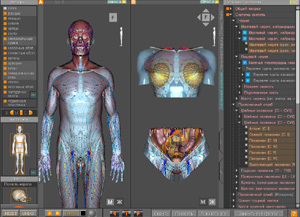 The "Arteksa Virtual anatomy 4.0" very easy to use. Just a few movements you find any organ, any very small and deeply located artery. This is achieved through a elaborate user interface. There are several tools to filter out the desired object. 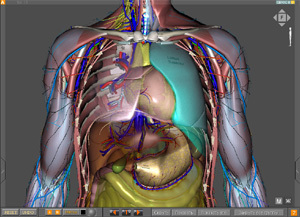 The program Virtual Anatomy 4.0 contains the classification of anatomical objects, constructed in accordance with international anatomical classification adopted in 1998 and translated into Russian in 2006, corresponding member of the Academy of Medical Sciences L. Kolesnikov (right now academician). The program includes 4741 three-dimensional objects, of which 501 belong to the female body, the rest to the male body. The program can use two windows simultaneously. A few useful tools to separate the needed to you objects from the others. The program includes a full set of anatomical objects necessary to study in medical school. 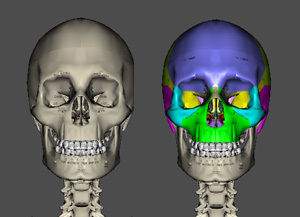 The "Virtual anatomy 4.0" is the developing group of authors under the direction of Professor V.I. Kozlov (Head of the anatomy department of institute of medicine in RUDN University (Moscow)). 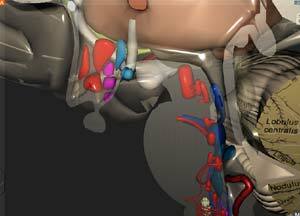 an interactive virtual atlas of human anatomy in 3D, designed for medical students and experienced practitioners. Technology display three-dimensional graphics based on OpenGL or DirectX are widely used in the gaming industry, which by now has reached greater heights with these technologies. Virtual human anatomy solves these problems. The study of anatomy on the human dead body does not always give the student the opportunity to see the layers, and also on the same corpse there are no signs of anatomical structures of the body parts, which are so necessary for the student, the student of any particular organ. 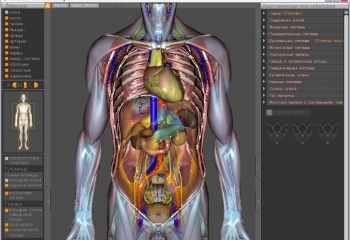 This program is not the first in the category of virtual atlas of anatomy, but (in our opinion) is the only one of its kind that is fully adapted to show entire anatomy of the human body structure without barriers and trade-offs. In our virtual atlas of human anatomy 3D you will most detailed way to get acquainted with the internal structure of a human, his cardiovascular system and the nervous system, brain, muscles, as well as fascia in the three-dimensional model. Each organ and even parts of it have the name, it is perfect for solving educational problems, or even banal as a guide for the student or an experienced physician, as our three-dimensional atlas compiled all the information about the human anatomy. In the future you are waiting for a very interesting program updates that add new features to it and make it even better and easier for you! Arteksa Company (ARTEKSA) is always ready to suggest and help in the development of the program. So if you want to ask any question regarding the program or its payment, or to express their wishes of the program functionality, we are always ready to help you! 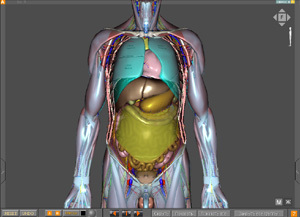 Download program "Virtual anatomy 4.0"